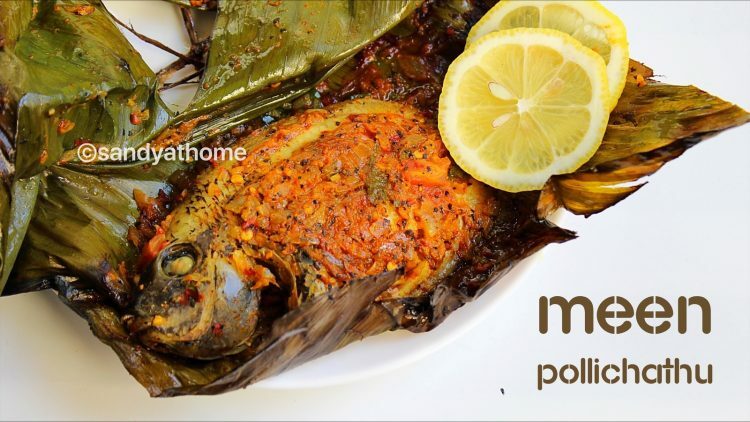 Meen pollichathu is a delicious and a very flavorful and healthy dish where fish is marinated with lot of spices and is wrapped in banana leaf and cooked on a tawa. Sounds interesting right? As it sounds interesting it is very yummy to eat and easy to prepare as well. 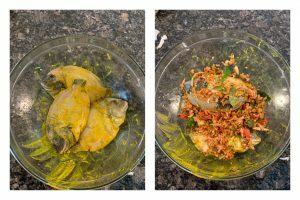 There are many ways to preparing a perfect meen pollichathu but here is one version that I learnt from a house boat chef/ cook years back. 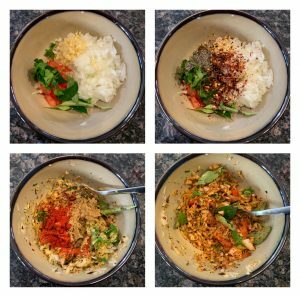 I have followed every single step mentioned and achieved the same texture and taste. 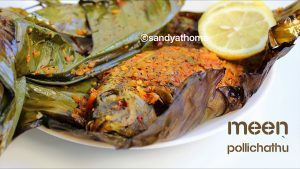 Usually this Kerala style fish pollichathu is prepared with karimeen but I prepared the recipe with pomfret fish which tasted good as well. So let’s get to the making! 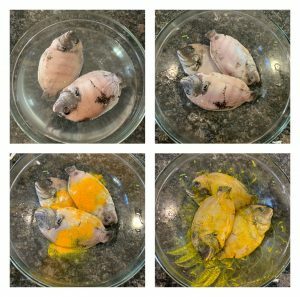 In a bowl place the cleaned fish, to it add salt and turmeric powder. Marinate the fish well for an hour. Meanwhile in a bowl add chopped onion, tomato, ginger, garlic, curry leaves, coriander leaves, salt, chilli powder, pepper powder, paprika/ chilli flakes and coriander powder. Mix well and keep it aside. Now to the marinated fish add the masala that we prepared. 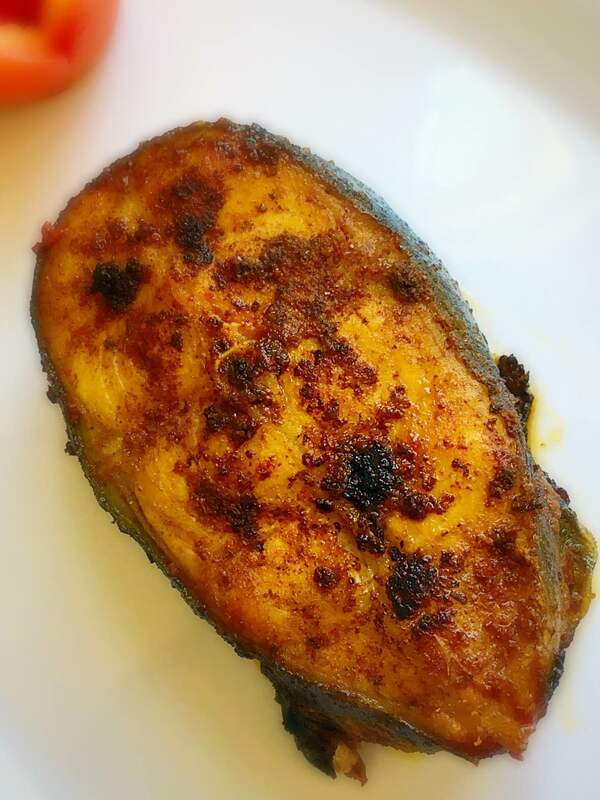 Coat the fish really well with the masala and let sit for 15 to 20 minutes. After 20 minutes heat a pan/ kadai/ tawa with 2 tbsp oil. Meanwhile take a 5 to 7 inch banana leaf or banana leaf depending on the size of the fish. 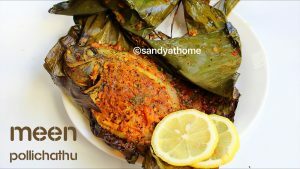 Place some masala on the banana leaf, then place the masala coated fish on the masala. 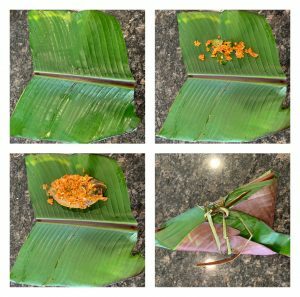 Wrap the fish completely and tie around the banana leaf fibre and put a tight knot. I used 2 fibers to keep the fish intact. 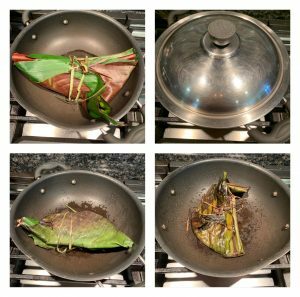 Now place this banana leaf with fish in the pre heated kadai/ tawa and close with a lid and cook for 8 to 10 minutes, after 10 minutes turn the fish over and cook again for 8 to 10 minutes. When fully cooked remove it from the kadai/ tawa. Open the banana leaf carefully as it will be really hot and relish it with few lemon slices. Repeat the process till all the fish is done. You can all the fish in the same time as well if you have big tawa. 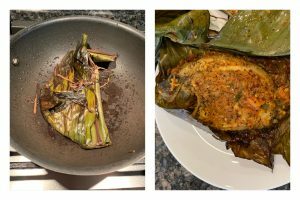 Now place this banana leaf with fish in the pre heated kadai/ tawa and close with a lid and cook for 8 to 10 minutes, after 10 minutes turn the fish over and cook again for 8 to 10 minutes. When fully cooked remove it from the kadai/ tawa. Open the banana leaf carefully as it will be really hot and relish it with few lemon slices. Repeat the process till all the fish is done. You can all the fish in the same time as well if you have big tawa.